Part of our Easter tradition is to make Easter Bread. 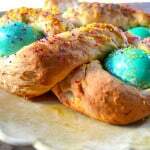 This is a sweet bread that is braided and has colored eggs nestled inside the folds. I love serving this with soft salted butter with our Easter dinner. I do know that some people serve their bread with breakfast. 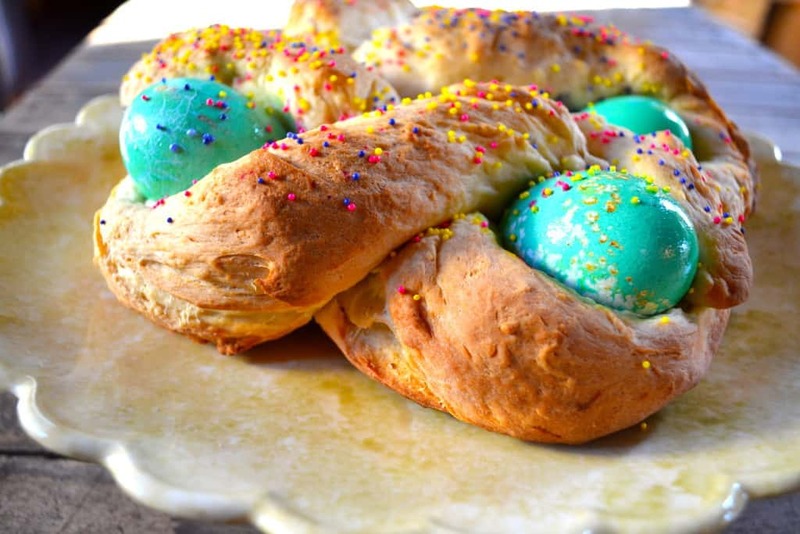 Either way this delicious Easter Bread will quickly become a tradition for your home too! Place yeast into warm water and let stand 5-7 minutes. In a large bowl, combine the 2Tbsp sugar and flour, add in the yeast mixture. In a mixer, cream together butter, sugar and salt. Add the yeast mixture and the remaining 3-1/4 cups flour until a ball is formed. Turn out on a lightly floured surface and knead - approx 10 minutes. Oil a bowl and place dough inside and cover with oil, cover with a damp cloth and let it rise in a warm area. 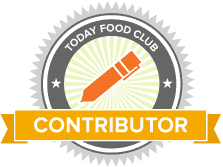 Deflate dough and cut into 4 equal parts. Roll each part into a rope. Using two pieces, braid ropes together and form a ring. Repeat with other two ropes. Lightly brush the top with oil and add sprinkles if desired.